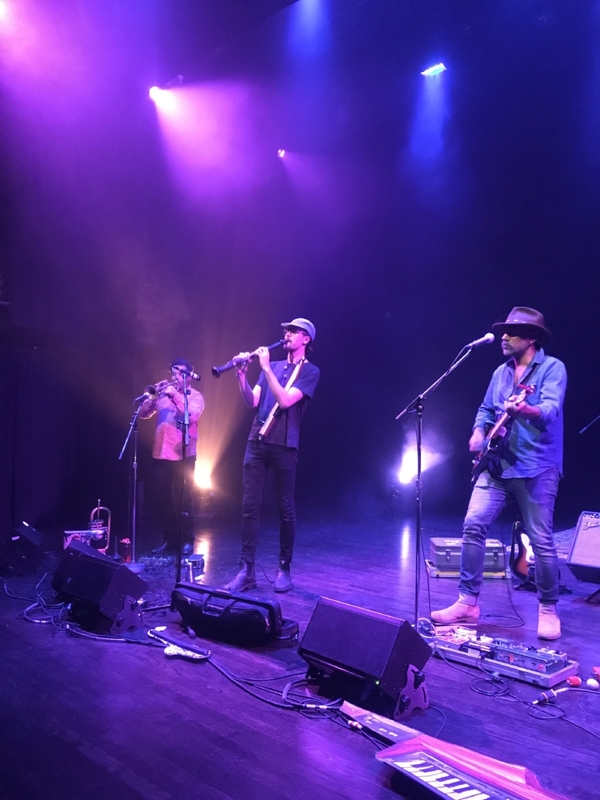 On August 26, 2018, Soft Cedar presented an afternoon rock show specifically targeted to young families in the neighbourhood. Instead of providing children’s programming, we decided instead to present an uncompromised concert experience that parents could attend with their kids. The event featured Victoria’s Peach Pyramid, Mark Mills, Balkan Schmalkan, an outdoor beer garden, 15 local artisans, 2 food trucks and headliners Brasstronaut. The late summer sky was overcast when the Cultch opened its doors for an afternoon of music, food, artisan vendors, and libations. Cheer shone amongst the smells and tastes of West Coast street cuisine. Plant junkies and necktie enthusiasts walked away with their usual treasures and all the honey and beeswax candles they could carry. Ebullient tots ran inside and outside the Vancouver East Cultural Centre. Families found respite in a calm-room stationed with crayons, paper, and floor pillows. Mark Mills overlooked the outdoor lounge from a stairwell balcony. Mills, a one-person pop show, strummed his guitar over programmed beats. Dancing parents bounced their children in their dexterous arms. The festivities moved indoors to the Historic Theatre. The elemental Peach Pyramid followed a Baltic brass band that was born of the earth and soil. Peach Pyramid's breezy pop-rock surfed along the top of a rolling, oceanic undercurrent. Like industrious caddisflies gathering twigs to construct a home, Brasstronaut piled and discarded musical layers to build their songs. The sonic architects flitted between jazz, funk, rock, pop, and ambient electronic. The ensemble contracted and expanded their compositions with percussion that could have shaken fruit from treetops. Brasstronaut molted and morphed, beat their wings, took flight, and rarely looked back down. "This is still a summer festival, so even though we're in the dark, we try to keep it lively," the band said. As they raved in shadows and free play unfolded in front of the stage, it became clear Brasstronaut had succeeded.